A 24-year-old Ballymena man has been charged with attempted murder following a stabbing in the town. Kyle Joseph Rainey, of Rossdale, Tullygarley, appeared at the town’s magistrates court on Thursday morning. 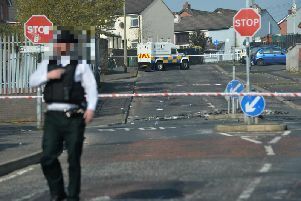 A police officer told the court she could connect Rainey to the stabbing, whch happened in Waveney Road, Ballymena on October 29. Mr Thompson said he was not applying for bail on behalf of Rainey as the defendant is due to be sentenced for a number on unrelated matters at the same court next week. “He has one or two matters in the background and I have given him advice about his current predicament because he has to look Your Worship in the eye next week for sentencing (on the other matters). “There is no value in applying for bail at this stage,” added Mr Thompson.